I believe you are thinking of instantaneous centers. There are indeed two of these. The roll center is located by the intersection of lines drawn from each instantaneous center through the center of the tire contact patch. Ah your absolutely right there, I was thinking of it as IC's, but there are also two methods used by people for determining RC's, one I feel more correct than others. 1. As you described, Find the IC's of the suspension linkage, and the axis between the center of traction and the corresponing IC. The intersection of both of these axis will located the RC. (most correct) this method shows at what point the body will "pivot" load transfers in lateral acceleration. 2. Another way is the intersection of those IC's to Tire axis with the vertical axis that passes through CofG. for which there are two seperate points. This way can be more revealing of Jacking forces and how the RC's interact with the cars body. But this, I think, shouldnt be called a roll center becuase it isnt the true datum for zero roll moment. this shows more of what Im talking about, per authors terminology he calls these points Force Application Points. Vehicle Dynamics isnt an exact science, but applied kinematics and FBD can be vary revealing. Afterall this is all done, we are still depeding on a street tire for which we dont know much about except overall characteristics, not exacting data. Thanks for your interest FieroWannaBe. I realize how complicated this subject is, and by no means do I pretend to understand a 10th of it. My ultimate goal here was to see if there was a not-too-complicated way to portray the effects of the changes I plan to make. I knew I needed to map out the suspension coordinates (done), map out some basic kinematics (mostly done, just not all posted yet), and hopefully out of the mess, a few simple conclusions about the effects of the longer wheel base, longer control arms, and a lowered CofG (supported by graphs) would fall in my lap. Theoretically each of these changes should improve performance, but so far, the "falling in my lap" part is still "up in the air". If you or anyone else believes they know how portray these modifications in the best light, then by all means send me a PM with your ideas. My goal with this thread however is to wrap up an abbreviated suspension analysis within the next three or four posts knowing full well there is much, much more to explore... perhaps in another thread. What I'd like to cover in the next three or four posts is the following: 1. the same graphs as above except with my final front configuration using the longer control arms and longer wheelbase with front drop spindles (rather than drop springs) vs stock; 2. the same graphs as above for the rear suspensio but also include a graph depicting the change in roll axis vs bump, and finally; 3. the effects of the redesigned rear cradle. After that, I really want to concentrate on building the rear cradle and emphasize construction instead of planning. I understand and appreciate your approach, and the work you have done so far is more than can be said for 99% of all modified road cars and 95% of all race cars. So I appluad you. I wont attempt to side track your process here, I only wanted to suggest a method of analysis for maybe a slightly bigger picture of modification effects. I know there are other threads were in depth indulgence and analysis would be more appropriate. I truely appreciate all your efforts, and then uncharacteristic willingness to share this hard earned insight and information. Im learning myself, Im no expert, jsut trying to provide my understandings and insights. I won't attempt to side track your process here, I only wanted to suggest a method of analysis for maybe a slightly bigger picture of modification effects. No need to apologize, in fact your feedback made me realize I was missing an important graph. Although it may not be the specific graph you requested (RC-CGH vs Roll), I do believe it's the one you may have meant. When Zac initally posted some graphs before we realized there were some errors, he included one like the one I think you recommended. The graph below shows how the roll center migrates vertically and laterally across the car for a given roll angle. Interpreting the curves, it's quite clear that the stock geometry (semi-circular blue line) does an excellent job of keeping the roll center from migrating in both dimensions. That minimizes the change in handling the driver feels as the car rolls (at least for the front suspension... we'll soon see it's not the case for the rear!) 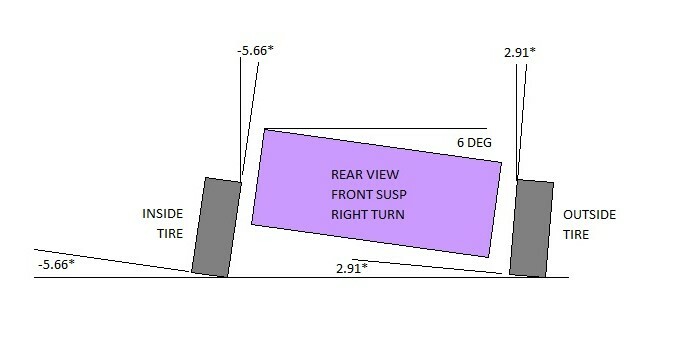 The 3" longer control arm configuration (purple line) shows that these arms impact the roll center location in three ways: they drop the roll center, cause it to shift 130 mm (5") to either side of the centerline when rolling left or right 6 degrees, but they also make vertical movement of the roll center nearly zero. Finally, the full monty configuration (red line) impacts the roll center even more negatively. 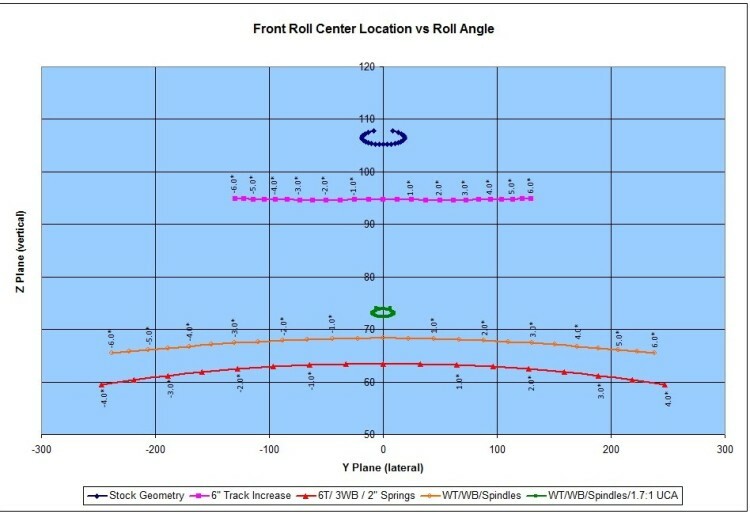 Once again, the drop springs are the primary cause of the additionally lowered roll center, but the side to side movement of the roll center is even more severely impacted in this config especially considering that the data for this curve only goes to 4 degrees rather than the 6 degrees left to right that the blue and purple lines depict. (The reason for the lack of data past 4 degrees is due to the suspension hitting the bump stops.) At 4 degrees roll, the roll center moves almost 250 mm (9.8") to either side of the centerline, more than a 260% increase over the amount the roll center moves with just the longer conrtol arms (at 4 degrees roll)! This appears to be the most significant impact that the drop springs incur upon performance. Potential Roll Center Movement Solutions: My understanding is that better lateral control of the roll center with the longer-arms-only-option could be achieved by restoring the stock angles and proportions between the upper and lower arms. 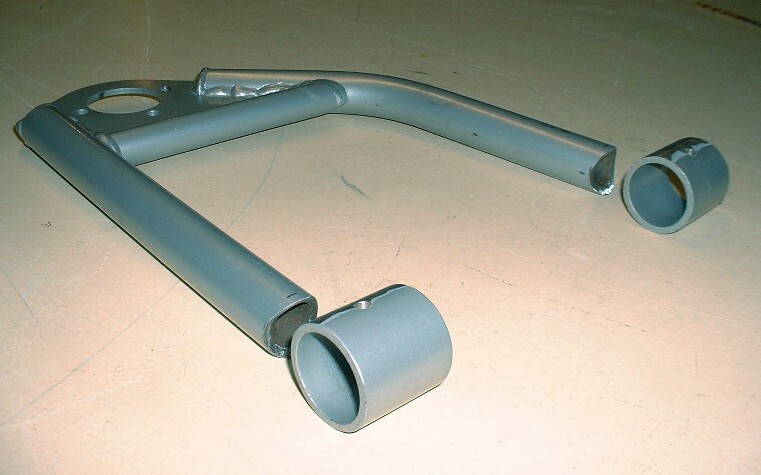 Remember that the longer control arms use the same inner mounting points and the same knuckle height as stock, so the effect of the longer arms is to lessen the angle between them by several degrees. To restore the angles, that would mean either raising the lower control arm mounting point by several millimeters or lowering the upper mount several millimeters, or some combination of both. 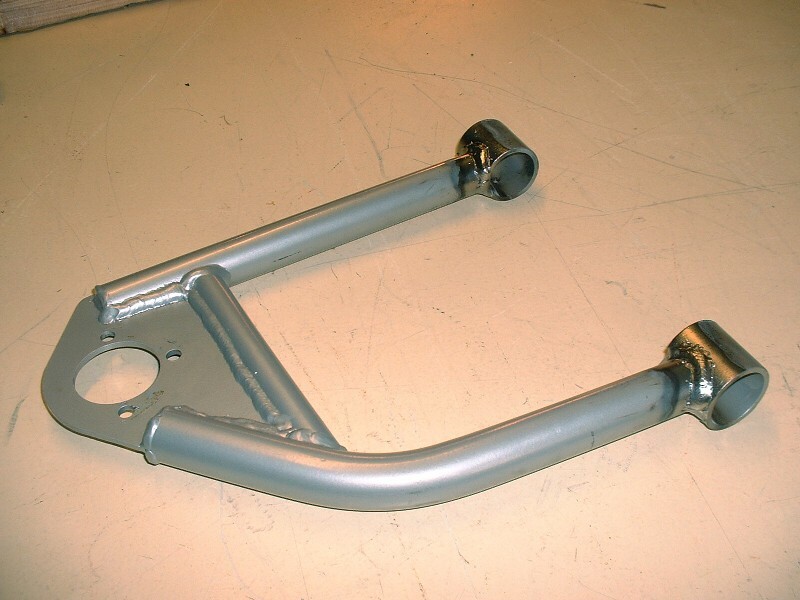 Additionally, the upper control arm would have to be shortened to restore the OEM ratio between the upper and lower arms, which would also necessitate moving the upper control arm mount outboard by an equal amount to maintain the upper ball joint in the extended location. 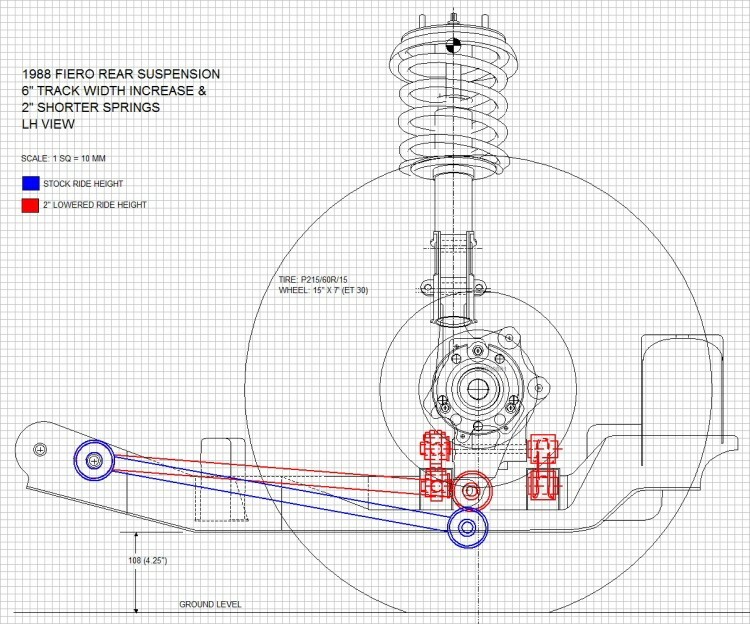 As for improving the drop spring performance (red line), I believe the swap to the drop spindles would bring it in line with the purple line, and then the same modifications to the control arm mounts and ratios would be needed to bring it closer to stock. Thats exactly the kind of analysis I was imagining, what you have drafted has all the information I was refering to and more. I think this may provide the best insight on how proposed changes will affect handeling performance. Good job and thank you. There are university students who do less work on their Formula race cars. ( I concetrated on hybrid drivetrain performance, so my optimization was a different animal). In order to restore the factory performance I think a good target to shoot for would be to restore the factory IC locations. of course as soon as the suspension moves that IC location is lost (engineers did a good job at constraining migration). Scaling the factory suspension would restore the factory kinematics though. Whatever 3 additional inches is to the a arms as far as a percentage, apply that to all other linkage lengths, not very practical. Its easy to see how analyzing 3 different solutions to track increase and height change, and picking the best of the 3 evils is the necessary/practical approach. Bloozberry I wish I could be a fly on the wall in your shop, I would be the smartest fly of all by keeping my eyes on your every move. Also if I lived next door to you I would be looking over your shoulder all the time and never want to go home. Your work is absolutely amazing, your so knowledgeable, and your attention to detail is incredible! You make me proud to be a fellow Canadian (and Fiero owner). Keep up this fantastic thread! I hope all goes well for you and that the final expenses won't be too hard on the wallet. If you recorded the photos with voice-over on CD and sell it on eBay, I would definitely be one of your first customers! I would watch it over, and over, and over, just like Mr. Bean video re-runs even though it's not a comedy (although it could be sort of if you add some #?!@$!? phrases when you find some unexpected surprises) LOL! New owner of Silver 88 Fiero GT and second time owner of 1985 Fiero GT. Bought my first fully loaded Fiero GT new in 1985. Fiero's are Fabulous, Fix'em and have Fun! Note, Avatar picture is Mr. Bean (not me, ha ha). Thanks for the compliments Canfirst! I'm afraid if you were a fly on the wall in my workshop you'd be pretty lonely... and cold. This computer stuff has had me pegged to my office chair for what seems like eons! 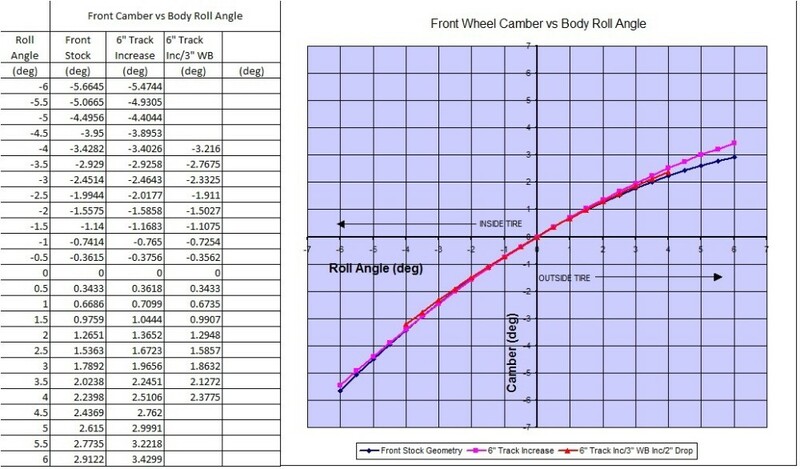 After reviewing the info I've posted so far, I realized there's yet another important graph to show what the front end is doing: Camber vs Roll Angle. I must admit I wasted some time trying to figure out how to calculate the roll angle of the car using various amounts of jounce and rebound on opposite sides of the car when it dawned on me that the data was right in front of my face. The Lotus software cranks it out, ready to be charted. Doh! Once you know how to interpret the info on this graph, it's pretty revealing about the mediocre nature of camber change on our little cars. There's two things to remember that will make using this graph really easy. The first is to ignore the negative signs on the horizontal axis (roll angle)... they're only needed to be able to plot the inside and outside wheel data on the same graph. The second is that the side of the car that the suspension extends will be called the inside tire and the side that compresses is the outside tire, just like in a turn. With those two things in mind, locate the same amount of body roll in both places on the horizontal axis (remember, ignore the negative signs). Then, to find the camber of the inside wheel, simply move down into the lower left hand quadrant of the graph until you hit the curve and read the camber off the vertical axis. For the outside wheel, move up in the upper right hand side of the graph. The convenient thing about measuring camber this way is that it also is a direct measure of the angle between the tire contact patch and the ground. If the tires remained planted square to the ground through the entire range of suspension travel, the curves above would be flat horizontal lines along the x axis. So that means that the two stages of modification both hurt camber gain in roll on the outside tire where it matters most. 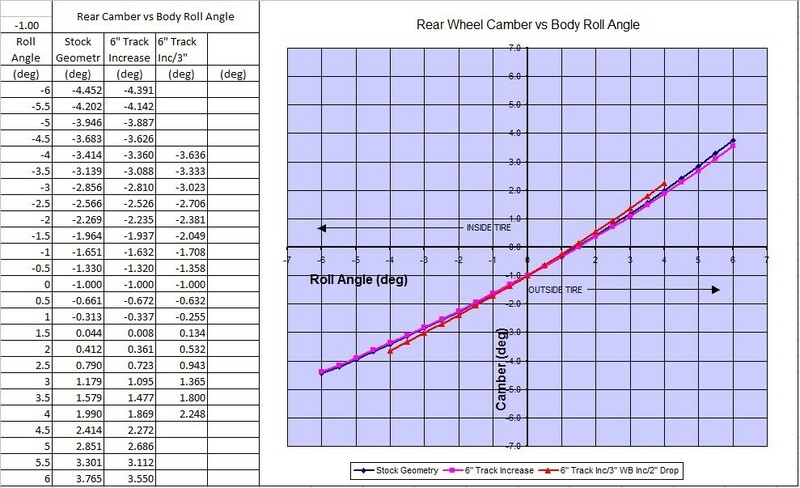 This also confirms what was found earlier in the camber vs bump graph earlier since the longer control arms dampen the rate that camber changes. For anyone keeping any copies of the graphs I've been posting, you should be aware that I made changes to the graph and text concerning the front toe vs bump on page 12 of this thread. I needed to make these changes when I discovered that the Lotus software program does not follow SAE convention for the polarity of toe measurements, which screwed things up. Since most of the same concepts apply equally well for the rear as for the front, I won't go into the lengthy explanations about toe, camber, and roll centers unless there are noteworthy differences. For ease in comparing the different graphs front to rear, the graph backdrops are color matched i.e. the two toe graphs are light green, the camber graphs are light blue, etc. I'll start with the rear toe versus bump graph. 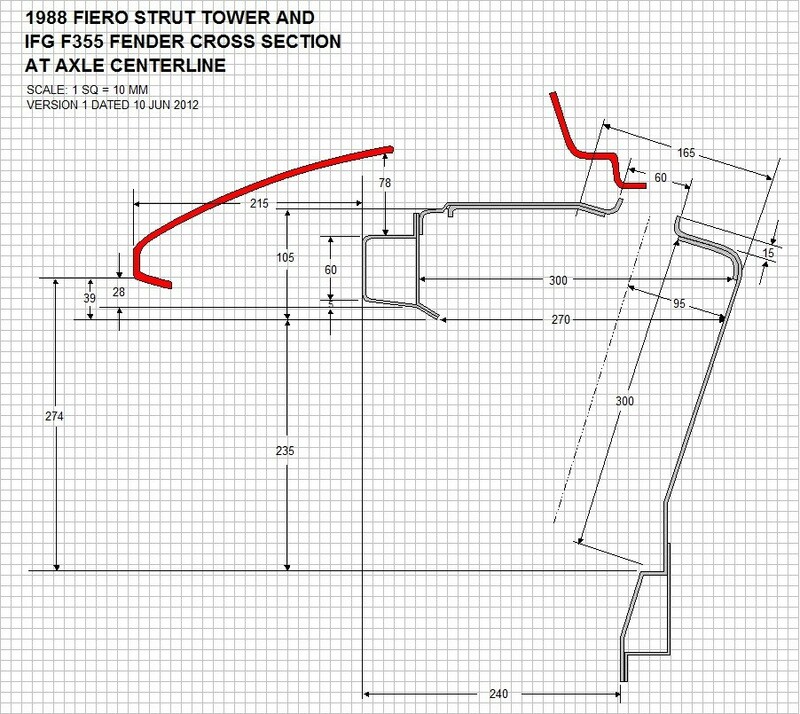 As with the front toe, the stock '88 Fiero rear knuckle is set statically during alignment with some toe-in, 0.15 degrees to be specific. Again, I've chosen to factor this out of the curves above since the toe will neutralize to zero once the car is underway. According to the service manual straightline driving forces will causes manufacturing tolerances to be taken up and reduce the toe to zero. In the stock configuration, it's clear that raising or lowering the suspension causes the wheels to toe-in considerably. This explains the Fiero's tendency to understeer despite the front wheels initially wanting to oversteer slightly. In roll, the outside rear tire toes-in causing the front end of the car to turn less than is commanded by the steering wheel input. The same happens with the 6" track width increase, only to a much lesser extent so this would tend to neutralize the understeer characteristic compared to the stock car. 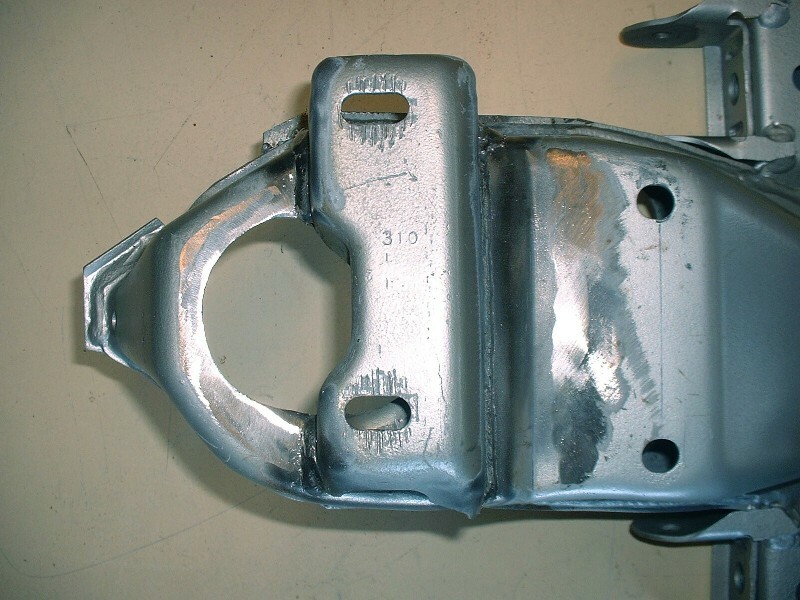 To increase the rate of toe-in, the front lateral link would need to be shortened and the cradle mount location for it would have to be pushed outboard by an equal amount. This would shorten the arc of the front link and cause it to pull inwards on the front of the knuckle as the jounce increased. The 2" dropped suspension increases the rate of toe-in considerably causing even greater understeer in roll. In this case, the front lateral link would need to be lengthened somewhat and it's mounting point on the cradle would need to be moved further inboard to reduce the rate. Rear Camber: There's a lot of discussion on the forum about the poor rear camber characteristics of the Fiero. So just how bad is it? Here are the two most revealing graphs about the rear's performance... one under bump, the other under roll. Both graphs above show camber after subtracting 1.0 degree of camber as per the stock alignment specs. The effect is to bias the camber in the negative direction to compensate for the poor negative camber gain. 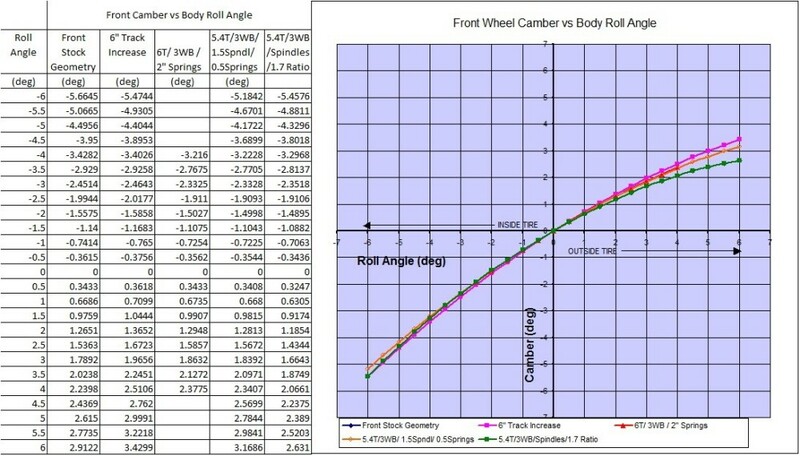 The most revealing is the camber vs roll graph which shows that even after the compensating -1.0 degree has been added, there still exists a 3.76 degree difference between the rear wheel's tire contact patch and the road surface at 6 degrees of body roll. This is 0.85 degrees worse than the front tire contact patch. Were it not for the static alignment spec, these numbers would be 4.76 degrees between the road surface and tire contact patch at 6 degrees body roll, a full 1.85 degrees worse than the front. The graphs show that the longer control arms improve the negative camber gain slightly but the addition of the drop springs worsen the situation significantly. This is keeping with a commonly known characteristic of strut type suspensions: provided the angle between the lower control arms and the strut as viewed from the rear remains less than 90 degrees, camber gain in jounce will be negative. Shortening the rear springs has the effect of angling the control arms upwards, bringing the angle between them and the strut closer to 90 degrees. The closer to 90 degrees, the slower the negative camber gain, and past 90 degrees the camber gain becomes positive. a. add even more negative camber to the static alignment, pushing the curves above further to the left, though leaving the rate of change (ie the slope of the curves) unaltered. This would have an overall negative effect by causing uneven wear on the rear tires since most straight line driving would be on the inner edge of the tires. It would also result in a loss of straight line rear traction since the tire contact patches would not be in full contact with the road. Lastly, because the shape of the curves would be unaltered, the new static camber value would correspond to maximum grip at only one specific angle of body roll and be compromised at every other angle. b. lower the attachment point of the lateral links on the knuckle in a manner similar to what Fieroguru (PFF member) has done here in this thread: www.fiero.nl/forum/Forum2/HTML/121052.html which would change the slope of the curves as shown here: www.fiero.nl/forum/Forum2/HTML/117227-7.html . The benefits shown are significantly improved roll center control, and about 1 additional degree of negative camber gain over 75mm of jounce. The disadvantages are a gain in toe-out (negative toe) of about 0.8 degrees over 75 mm jounce which increases oversteer, and the complexity of the necessary metal fabrication. c. decouple the fixed link between the strut and the upper knuckle making it a pivoting link, and replace the upper knuckle control with an upper control arm. Depending on the design, the designer could theoretically create the ideal amount of camber change throughout the entire range of bump and roll. 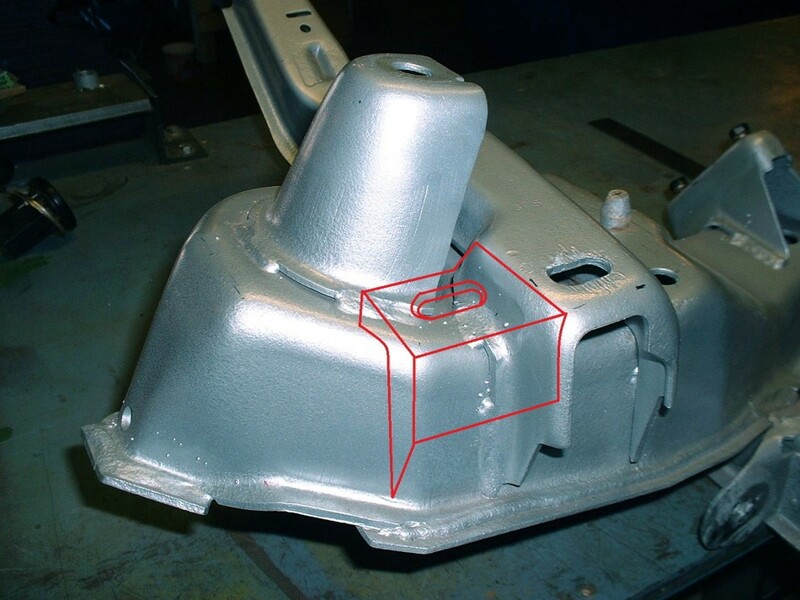 The difficulties with this approach are the actual design process which must optimize the control arm location and dimensions given the physical constraints of packaging the arm within the available space. Next up: rear anti-squat and roll center movement. Anti-Squat: Rear anti-squat is similar in concept to front anti-dive, where the suspension components can be designed to resist a portion of the rearward weight transfer during acceleration rather than transferring the weight entirely to the springs. The graph shows that as jounce increases, the percent anti-squat for all three suspension configurations decreases. 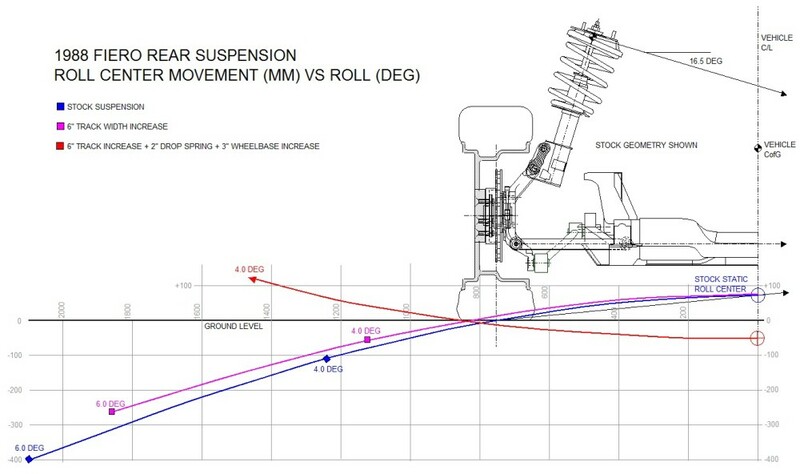 The longer control arms option (purple line) actually improves the characteristics over the stock suspension everywhere in jounce except for the first 10 mm of compression. The shortened spring version with the extended arms (red line) significantly worsens the anti-dive though. Recalling the anti-squat equation from page 9 of this thread, it's easy to see how dropping the suspension 2" significantly reduces the angle of the trailing link, thereby reducing anti-squat. Here's a quick drawing showing the trailing link angle before (blue lines) and after (red lines) the drop. 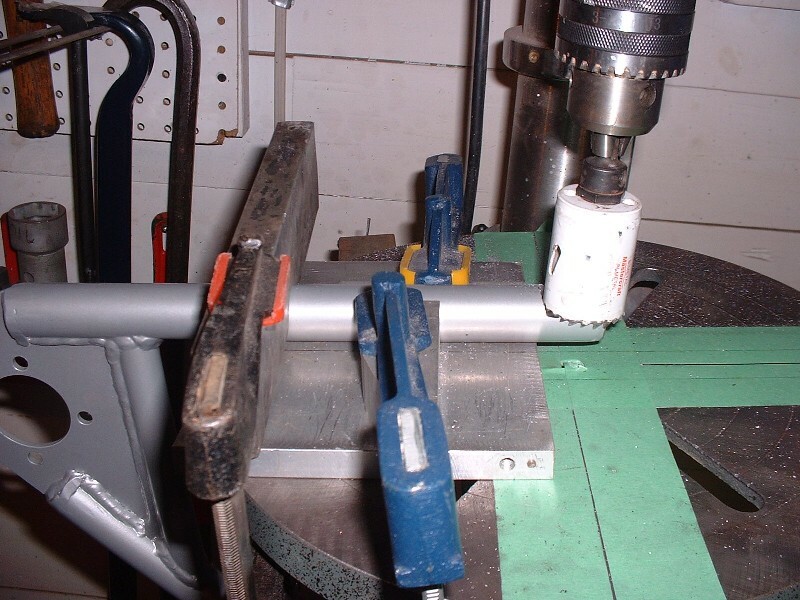 b. lowering the mounting point of the trailing link on the knuckle (like Fieroguru's solution pointed out earlier). A better solution would be to raise all of the suspension link mounts on the cradle by 2" to regain the stock geometry, although the strut upper mount would also have to raised 2" or the lower mount would have to be dropped to regain the full suspension travel. Perhaps an easier solution would be to raise the entire cradle higher up into the frame of the car if sufficient clearance could be maintained in areas such as the underside of the decklid to engine top, and axle to underside of the lower frame rail. This option would also require strut mount changes to regain full jounce travel. All of these options would require metal fabrication skills and would be constrained by available space. Rear Roll Center: Two graphs are used to assess the changing roll center. First up for analysis is the changing distance between the roll center and the CofG in bump. The '88 Fiero rear roll center is controlled by the stock suspension significantly worse than the front. Since the curves are sloped such that they rise to the right, then the distance between the CofG and the roll center increases as the body rolls. This means the roll stiffness decreases under roll, since the same G forces exerted by the wheels on the chassis would have a growing moment arm the more the body rolls... not a desirable characteristic. The longer control arm configuration is actually an improvement over stock, lessening the distance between the CofG and the roll center by 43 mm (or 7%) at full jounce. On the other hand, the drop spring modification (red line) significantly worsens the roll moment arm since it increases the distance between the roll center and CofG by at least 115 mm's at every point as compared to stock. A better appreciation for the instability of the rear roll center can be seen by analyzing the rear roll center location as the body rolls. In his book Chassis Engineering Herb Adams states that the most successful cars have the roll center height between 1 inch above ground to 3 inches below the ground. The Fiero rear end falls considerably outside these limits. The longer control arm configuration (purple line) dampens the rate of movement of the roll center but still allows it to move within a huge range vertically and laterally. An interesting result happens when the longer control arm modification is coupled with the spring drop (red line): the roll center raises rather than lowers as the body rolls. Theoretically, the rising roll center will result in increased jacking forces causing more of the weight transfer to be counteracted by the outside suspension arms rather than being absorbed by the springs. 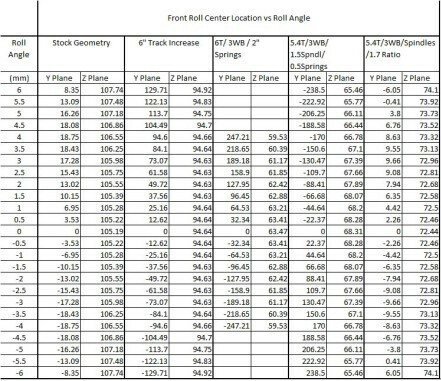 Potential Roll Center Solutions: As I see it, there are two steps needed to correct the roll center migration problem with the dropped suspension. The first is to find an alternate way to lower the car other than by dropping it on the springs, and the second is to rein in the instantaneous center. When it comes to lowering the rear suspension, restoring the stock angle of the lateral links is primary. The same solutions used to correct the anti-squat apply here equally well: either raise the control arm link mounts on the cradle, lower the link mounts on the knuckle, and/or raise the entire cradle up into the frame. To restore the stock strut travel, the top strut bushing can be flipped to gain 1", and if using the wider track, the strut to knuckle adapter can be modified to attach the strut to the knuckle lower down. To rein in the roll center movement, it helps to understand why it moves. Since the roll center location depends on the intersection of two lines, one perpendicular to the strut and the other through the lateral link pivots, the main problem with a strut-type suspension is that the strut angle doesn't move appreciably throughout the range of suspension travel. This leaves the change in angle of the lateral links as the sole variable responsible for the change in roll center as the suspension compresses and extends. In double wishbone style suspensions the upper and lower control arms both change in angle and can be designed to hold the roll center location relatively constant as we saw with the front suspension. b. results in greater negative camber gain in jounce or for any given amount of body roll... a characteristic the rear end sorely needs. I still have to research any negative impacts of decreasing the strut angle, and then determine the angle that optimizes the positive and negative characteristics within the physical constraints. The method of tilting the strut seems easy enough with the increased track width since a strut to knuckle adapter is required anyways. Given that a new strut adapter would need to be built to gain lost jounce travel from lowering the car (as mentioned before), the design could easily be adapted to suit a different strut angle as well. Finally, one other potential solution to controlling the roll center would be as described in the section discussing camber, that is: decouple the fixed link between the strut and the upper knuckle making it a pivoting link, and replace the upper knuckle control with an upper control arm. This would likely result in the greatest ability to control camber and the roll center, but for reasons discussed earlier, it would likely also be the most complex solution to execute. More excellent work Blooze! I would like to give you a + for every drawing or suspension curve if I could. If there is sufficient anti squat this had good potential, but if not, under acceleration, the rear of the car will squat, reducing the tires contact patch due to an increased negative camber gained at both wheels, and can limit your available traction, combined with turn-out this can lead to oversteer. Counter this with more anti squat you may not have a problem, until your entering a braking zone. Then the anti-dive, turns to pro-lift as the forces reverse (the body lifting the suspension on deceleration), and there could be a problem with brake hop in the rear, and rear end instability under braking (very bad). The hardest part of the design in finding the perfect balance, and then packaging it. Pontiac did a decent job on the 88, but the rear geometry still left some development on the table it seems, perhaps due to packaging constraint, it looks as though there could be more done to increase rear stability, and tune out the built in understeer. It does look like a nice track increase can be part of that solution. Good Job. Thanks for the feedback fieroguru and FieroWannaBe. I appreciate the encouragement since this stuff can be pretty tough to get motivated to work on. c. filling the front wheel wells with the right size wheels: 215/45/17 tires on 17 X 7 (ET 47) wheels. The somewhat narrow front tires give an approximate ratio of 45% contact patch front / 55% rear in keeping with the weight distribution of the car. The rears will be 18" X 265 mm wide. Knowing the final configuration allowed me to send the last set of suspension coordinates to Zac88GT for him to run through his Lotus Suspension Analyzer software. Having known from the start that drop spindles are an inherently better solution than simply using drop springs, I was initially quite disappointed when I re-plotted the performance curves and found this combination to be only marginally better than using drop springs. This new case is shown by the orange lines. I knew there had to be a way to squeeze better performance from this combination, so I decided that the next most logical step would be to shorten the upper control arm to mimic the OEM ratio between it and lower arm. I started by lopping off 29 mm from the upper arms in my drawings, then asked Zac to run a few iterations shortening them even more in 1 mm increments until the best possible performance was achieved. The end result was to shorten the uppers by 35 mm. 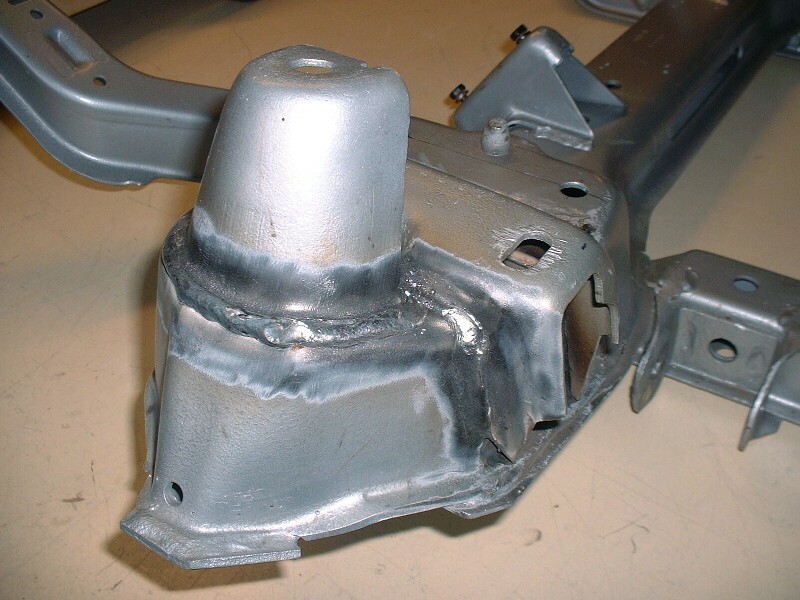 This of course will entail relocating the upper control arm mounts on the front crossmember 35 mm further outboard, but that appears to be a relatively simple affair after having confirmed the possibility on the actual crossmember. Result: within a whisker of the stock performance in jounce, and improved performance in rebound. Result: identical performance compared to stock configuration (stock curve hidden by overlap). Result: improved performance over stock by changing front oversteer in jounce to slight understeer (near neutral steer) up to 50 mm jounce. Result: identical performance compared to stock configuration. Result: tighter roll center control and lower, improved roll center location compared to stock. I consider the final configuration to have accomplished my primary goal of getting the stance I was looking for, and was pleasantly surprised that I didn't have to settle for simply minimizing the impact of these modifications. I hope this will be more than enough to satisfy provincial regulators that my new config meets or exceeds the OEM's configuration. Next up: a break from graphs (altogether now: YAY! 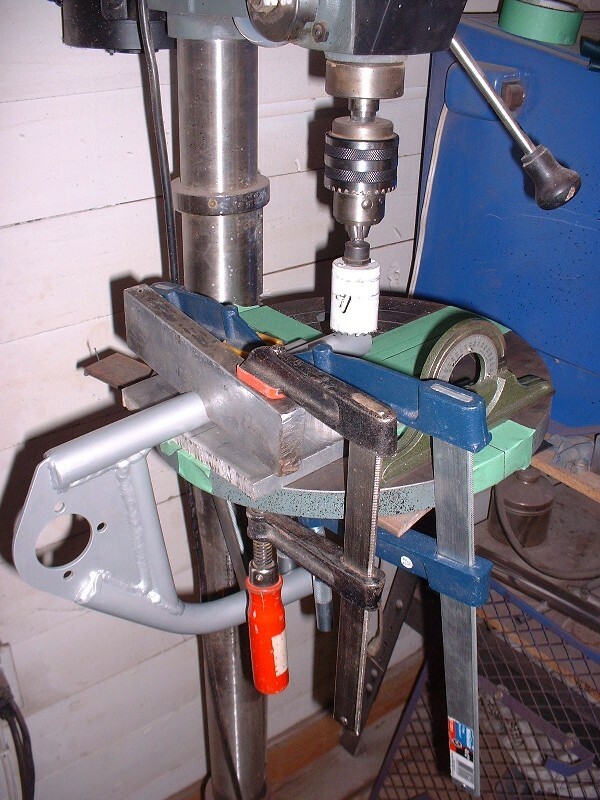 ), and a return to the workshop to modify the front crossmember and shorten the HT Motorsports upper control arms. This would probably have been the route I would have taken had I not been worried about the unwanted attention the obvious add-on might draw during the engineering certification phase of registration. Then it dawned on me that there might be enough room to simply relocate the OEM mount. The advantage is that it would appear very OEM. The disadvantage is that it would mean having to relocate the shock mount as well. I'm not worried about it affecting performance, just the extra work! So out came the safety goggles and the die grinder equipped with a cutoff wheel. 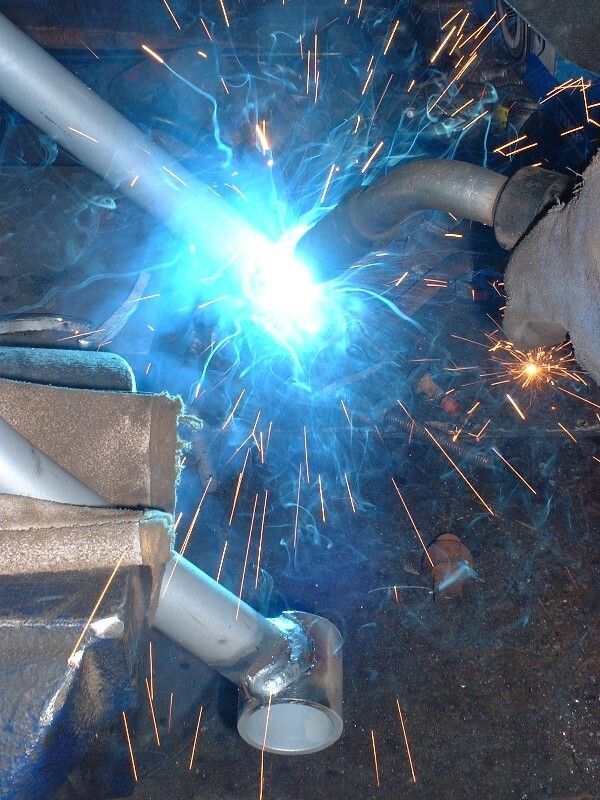 One thing I can tell you is that those factory welds penetrated very deep into the cross member. Using the cutoff wheel with 120 psi air pressure, it took me nearly 15 minutes of grinding per shock mount to work my way through the steel. Needless to say, I wasn't looking forward to cutting the 5" long weld seam on the control arm mounts. There are a few obstacles to getting the perfect cutting angle; the first being the non-removable cross member alignment pin on the driver's side. 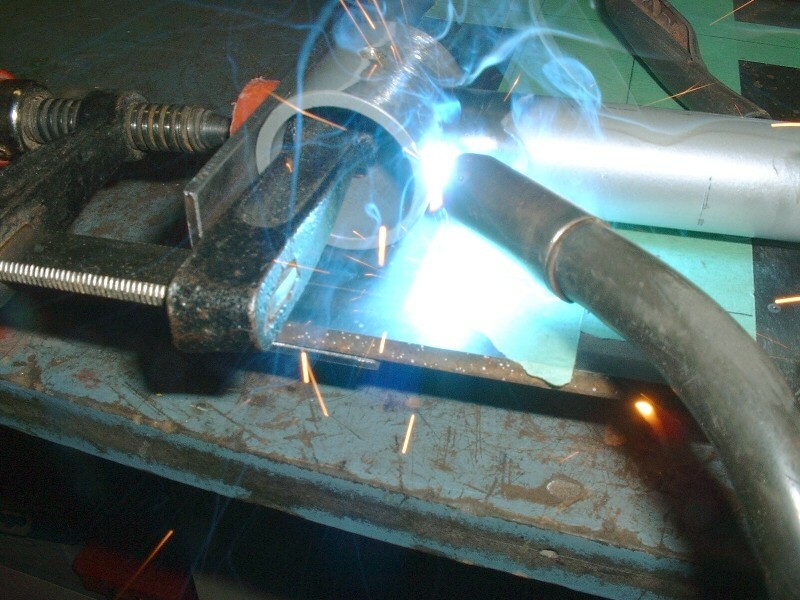 The other obstacle is the return flange along the bottom edge of the crossmember which prevents you from cutting the vertical welds all the way down. 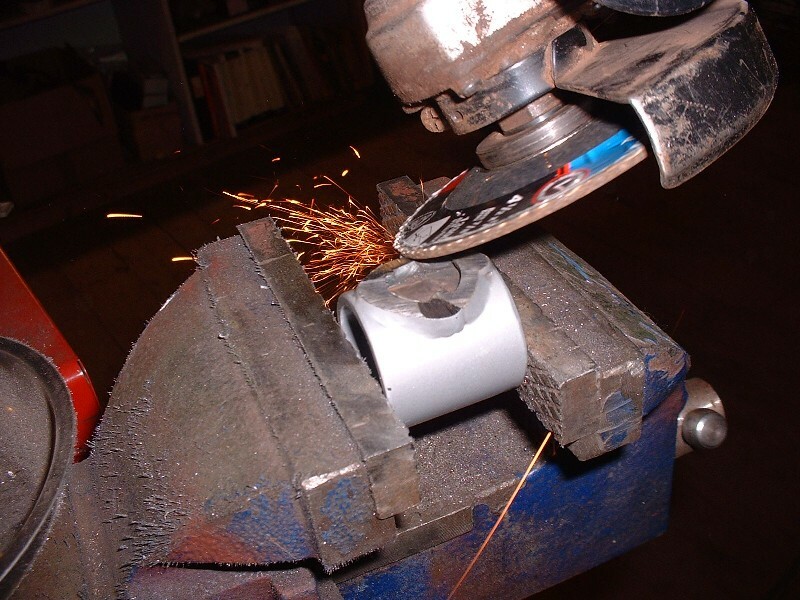 The smaller the diameter of your cutting wheel, the closer you can get to the bottom. These control arm mounts took a solid 1/2 hour to cut off per mount. They are some heavy suckers too. I haven't measured the gauge of the steel but they're at least 1/8" thick. Can you imagine the die pressure needed to stamp one of these out of a flat sheet? The eagle-eyed among you will notice the gloved hand in the last photo. Anyone living in Northern climes will know that you can't use a die grinder bare-handed very long in the winter if your compressor is not in a heated room. It gets soooo cold, it develops a layer of frost on the outside, no joke. That's why I use an electric hand held grinder with a cut off disk... it gets warmer the longer you use it! I am also spoiled these days, my garage never gets below 50 degrees! If you need any tabs or brackets off the 88 front crossmember, I have 4 of them on the shelf and one was involved in a roll over (bent lower a-arm mounts). I heat my workshop too, but my compressor is in the basement, which I don't heat. Having it down there keeps the noise down but the downside is that the air is ice cold. I was starting to have regrets about not choosing my first option to extend the UCA mounts rather than relocate the stock ones. It was a ridiculous amount of work to cut them off, and now I was looking at the prospect of trying to modify them so that they would remain at the same overall height, retain the 5 degree slope backwards for anti-dive, but mount them further uphill onto a surface that was sloped 15 degrees sideways. It might sound easy, but when you have a ruler and a level in one hand and a saw in the other, it suddenly becomes a bit more complicated. The blue lines show the stock location of the UCA and shock mounts, and the red lines show where they need to be, 35 mm further outboard. When faced with a task I'm not sure how to do, I often find myself cleaning my shop... that's part of the reason why it's taken so long for this update. 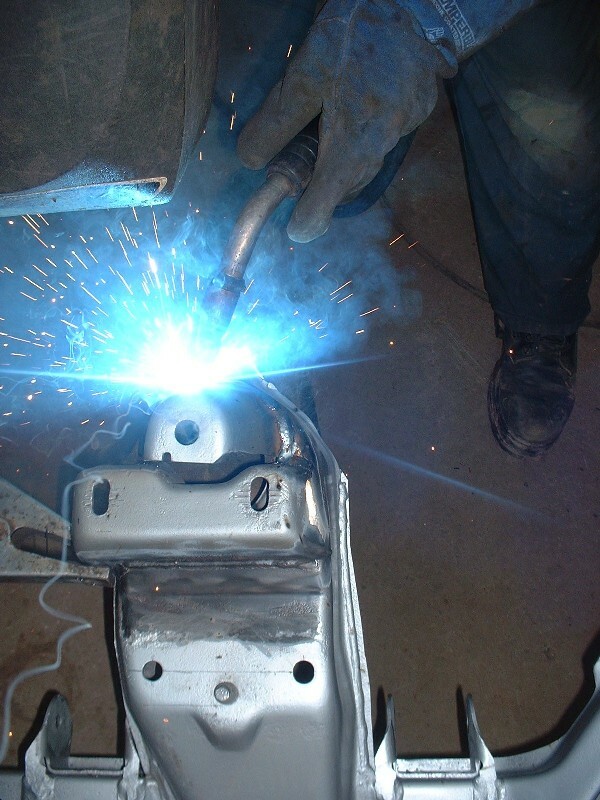 Once that was done, I started with the easy stuff like knocking down the old OEM welds on the cross member with my angle grinder... anything but address the challenge of modifying the mounts. Turns out it was a good thing. Something that was not at all evident when I drew my earlier drawings of the cross member jumped out at me while grinding. With the UCA and shock mounts no longer obscuring the OEM design, it was clear that the outboard upper surface of the cross member (which is sloped 15 degrees laterally across the car), is also tilted backwards with a built-in 5 degree slope longitudinally (backwards). The OEM mount straddled both the straight-and-level portion and the sloped-and-tilted portion of the crossmember, so it was designed to account for this strange transition. By moving the UCA mounts outboard 35 mm, this places them entirely on the compound sloped surface, simplifying my life since I need only worry about retaining the original height of the mount, while accounting for the 15 degree lateral slope. The 5 degree longitudinal slope takes care of itself. So the only two operations that were needed were 1. eliminate the built in 5 degree anti-dive by first making the bottom parallel with the top. Then 2. shorten the overall height of legs since moving it outboard also forces it up the 15 degree slope. (Disregard the long legs at the extreme right and left of the photo, those aren't the legs I'm talking about.) Rather, the legs are the lower horizontal edges. 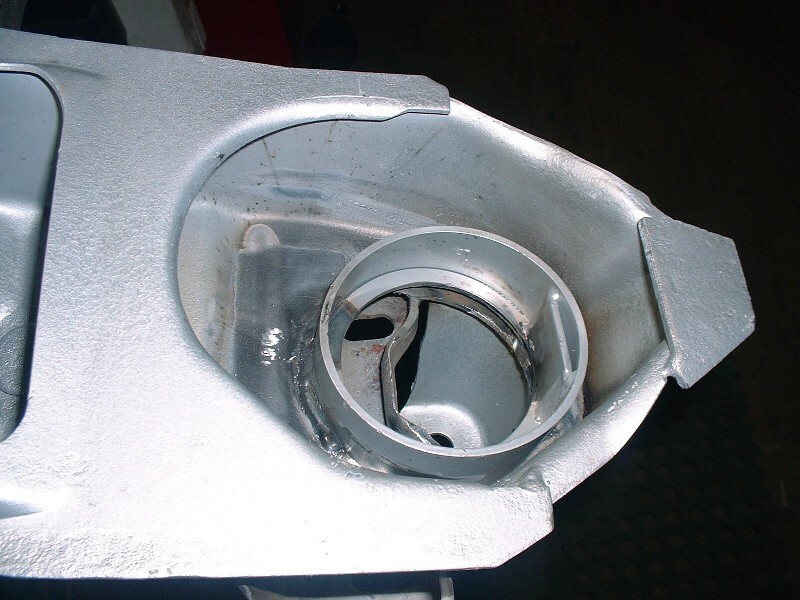 Obviously the outboard leg (foreground) had to be cut shorter than the inboard leg (background) to account for the 15 degree slope of the crossmember. Confused yet? So with the first mount trimmed just right, I test fitted it to the cross member and measured it for being level in the lateral (cross-car) plane, and for 5 degrees in the longitudinal (fore & aft) plane. A bit of tweaking with a file and my angle grinder, it was ready for welding. Looking good! You are the master of measurement. LOL. I'm not so sure about that Fieroguru... once I update the stock cross member drawing, it'll be version 3. The first control arm mount took me 3 hours to cut off and modify, the second one took 1.5 hours: amazing how experience saves time. Both mounts are now ready to be welded back onto the cross member, but I'm holding off until after the control arms are fully modified. I want to build up the assembly, place the knuckle at zero camber, then weld the mounts so the control arm mounting bolts are centered in the slotted holes in the mounts. I also want to be sure there will be enough room for the shock to pass through much smaller hole in the cross member now that the mount encroaches in that space. Once all four bushing housings were amputated, I chucked them up in the vise and cleaned off the old welds with the angle grinder. These puppies got HOT. The last thing I needed to do was to set the angle of the entire table to compensate for the slight angles that the control arm legs meet up with the bushing housings. The curved leg meets up at 1 degree, and the straight leg at 5 degrees. Here you can see my angle finder resting on the table. My little Fourney 100A MIG welder is OK for non-critical stuff, but doing this job right called for the help from the local certified welding shop. His Miller 200A MIG made quick work of joining these parts together again, with nicer, deeper welds than the HT arms came with originally. Once the smoke settled, I cleaned up the burnt off paint with a wire wheel. 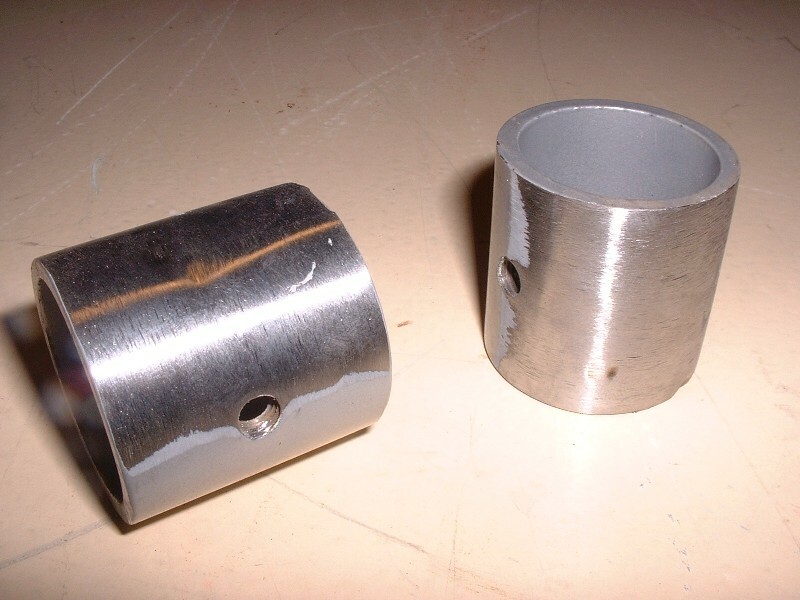 I had to grind one small nugget from the inside diameter of one bushing eyelet since the weld penetrated right through. No biggie. At least I know it won't come apart on the road! Lastly, here's an overall view of the shortened arm. A little primer and some new paint and it should look like the new piece it is, only better. 2. cycle the suspension through its range of movement to check for any interference issues. Next up: addressing the shock absorber problem. It's all looking well exectued. As I mentioned before, moving the UCA mounts outboard meant that they ended up encroaching on the space where the shock absorber comes through the cross member. 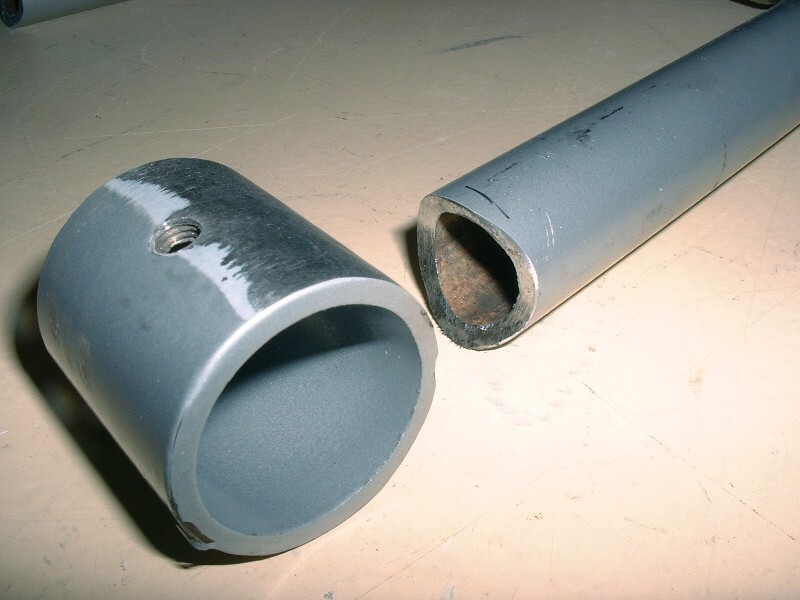 The body of my shocks are 42 mm diameter, and thenew, smaller space for it to come up through measured about 45 mm. Not enough room considering how much the shock changes angles as it's compressed and extended by the movement of the lower control arm. Here's the view from the underside. Notice the OEM spring seat is formed from the edges of the hole in the cross member being formed into a 90 degree lip. 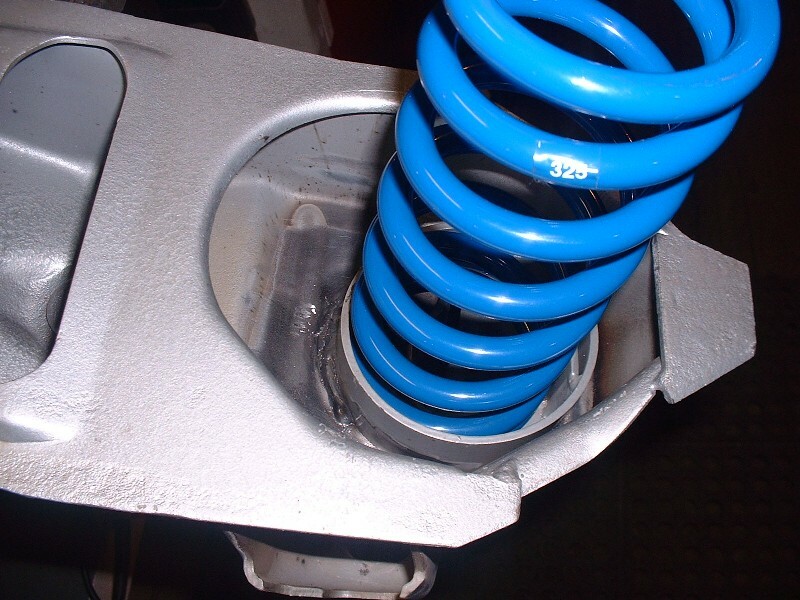 Since the adjustable HT coil-over springs are a different diameter than the OEM springs, the HT kit supplies you with new spring seats that are supposed to be slipped over the OEM seats, and peened into place. But I needed to relocate the spring seat to enlarge the through-way hole for the shock body, so the OEM spring seats had to come out. A cutoff wheel on the die grinder made short work of that. I followed up the die grinder with the angle grinder (just barely fit) to smooth out the remainder of the old spring seat and bring it flush with the surrounding material. I needed to do this to give a nice level mounting surface for the new HT spring seats later on. Working from the bottom, there was plenty of room to mark out and enlarge the shock through-way hole in the cross member. I used the HT spring seat as a guide to trace the outline on the underside of the member, and then chucked up a carbide grinding bit to hog out the hole, leaving plenty of material edge-wise to maintain the strength of the area. 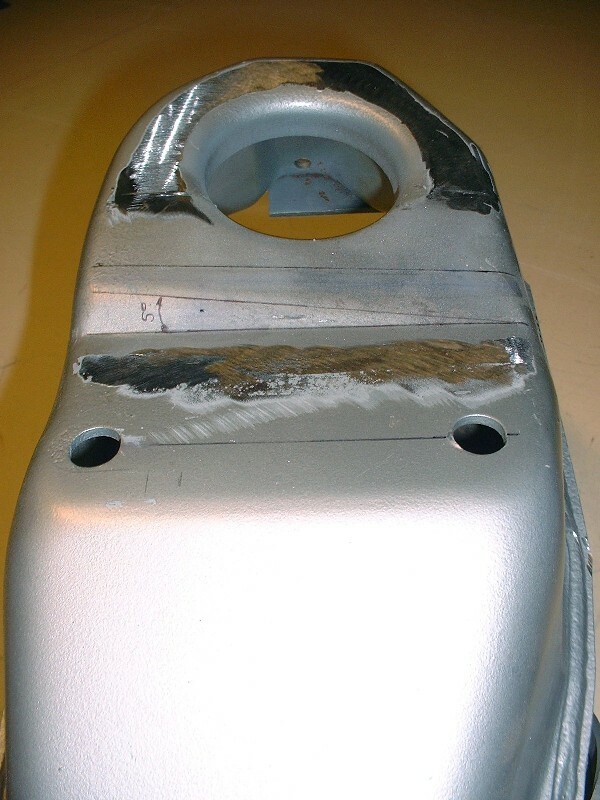 Here's a top view photo to show how much further outboard the hole was made. Compared to the first photo in this post, the amount of material removed is obvious. The next step was to reconnect the front suspension again and make sure the shock would clear with lots of room throughout the entire range of travel. This time everything checked out with room to spare. Considering I had only 1.5 mm clearance all the way around when I started, this pic shows how much additional clearance was gained. The upper shock mount was left off for clarity. Next up: welding the HT spring seats and the upper shock mounts in their new locations. The instructions that accompany the HT Motorsports front adjustable coil-overs state that their new spring seats need only be "glued" over top of the OEM spring seats with a 3/4" bead of silicone. They claim that upward spring pressure will keep the seat properly located, and that the silicone will absorb vibrations and prevent squeaking. To be fair, they suggest that you peen the new seat into place, though they say it's not necessary. I'm not sure I would have prescribed to the gluing philosophy even if I hadn't cut off the OEM spring seat. 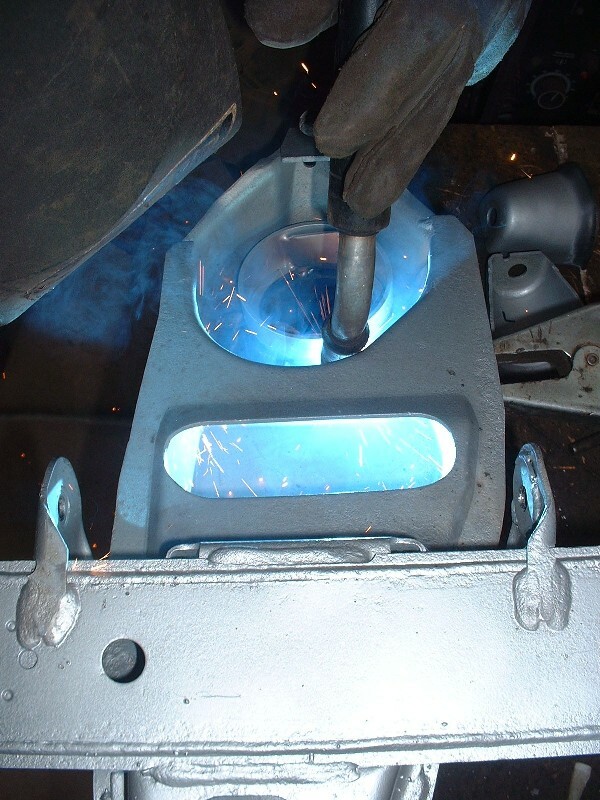 I'd rather have something as important as the spring seats very firmly attached to the cross member, so I tacked them in place in preparation for final welding. These needed to be welded before the upper shock mounts since I needed access to the spring seats from both the top and bottom for welding, and the shock mounts would have blocked access from above. The HT seats are actually beveled in one direction, and have a flat bar welded inside them to properly locate the spring since the ID of the seat is slightly larger than the OD of the spring. The tab goes to the outboard side. Once they were welded in place, I test fitted the springs just to show how they sit inside the seats, rather than outside the seats like the OEM ones. Finally, the last step before priming and painting was to weld the upper shock mounts in their new location. There wasn't enough room to move them the full 35 mm outboard like the UCA mounts, so I moved them to the furthest outboard point possible; about 25 mm if I recall correctly. I marked the optimal location the last time I had the suspension built up, so it was just a matter of tacking them, then giving them the full blast. Here's the final outcome. The best thing about it is that it looks totally stock even to the trained eye. My boys and I are finally starting on our 85 Fiero rebuild. Its been in storage since 1988......10 years before they were even born. We are planning a 355 kit with small block and full suspension and running gear upgrades. I just stumbled on this forum today and saw your project. Very impressive. This is without a doubt, the most impressive build on this site! Very envious of each and every one of the many skills you have showed us through-out this build. Thanks for the kind words aeffertz. For Yarmouth Fiero: Good to see there is yet another Maritimer that's into Fieros. We are few and far between so we would do best to stick together and trade ideas and info. You say you're "planning" a 355 kit... does that mean you haven't yet bought it? If not, then I highly recommend the AD355 kit over the IFG kit for reasons of quality. You'll save the extra money many times over by avoiding the IFG kit. Anyways, rather than discuss that stuff here, I'll send you a Private Message (PM) so we can exchange contact info. Back to the thread: It's been far too long since I've posted an update (busy with spring chores) but that doesn't mean I've been neglecting the project car entirely. I've moved on to planning, measuring, and drafting the new rear cradle, which has proven to be an exercise similar to solving one of those Chinese puzzles where a whole bunch of random pieces have to be slid upwards, downwards and sideways one at a time and in a precise sequence in order for all the parts to line up and make a complete picture. More on that coming soon, so stay tuned. And this one is the "after" pic which proves it all went back together without a hitch! The last thing to do is consider swaybar options, but I'll worry about that later. These are awesome shots. Very clean and precise. If I can achieve a fraction of this on our build, my OCD will be quite satisfied. Blooz, as always your knowledge and attention to detail are spectacular. I can't wait to actually see this and your Pace Car in person!!! Thanks Yarmouth Fiero and johnyrottin for your comments... (although I'm not sure what you mean by my "Pace Car" there Johnny). So now onto the rear end. I must say that the rear is definitely the most challenging portion of the suspension since there are many more variables to deal with than with the front. The same three basic issues confronted me at the back: get the wheels outboard 3" per side, lower the body onto the wheels by about 2", and retain or improve theoretical suspension performance for provincial certification. 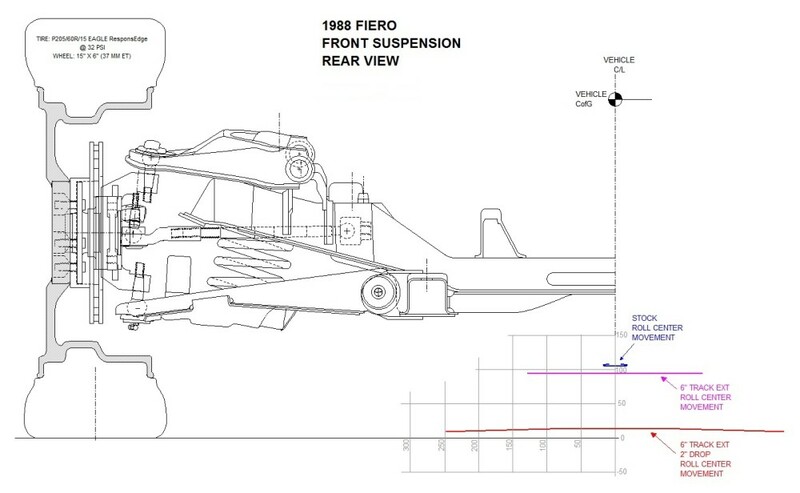 In addition though, the rear suspension must also accommodate the physical space requirements of the F40 six speed and the Northstar engine... plus take into account the poor design of IFG's F355 body on the Fiero chassis. To the inexperienced, most of these criteria might appear independent from one another but as you'll see they are all interconnected. I still get panic attacks occasionally wondering if it was a big mistake to buy this half finished kit. I get discouraged when I think about how much easier my life would be if I were to have bought an AD355 kit instead. I suppose I can always do that later if I can't muster up enough magic to make this look right. I think I went back and forth to rectify inaccuracies in this drawing a hundred times before I started getting repeatable measurements. Once I was satisfied, I added it to the rear view of the stock Fiero suspension to quantify what needed to be done, and where. I also added the cross section of the stock Fiero rear fender (in blue) on it for reference too. There's a couple things to note from the above drawing. The first and most obvious is that there is over TWICE the clearance between the top of the stock tire to the bottom of the IFG fender lip. That's 161mm or 6.4"!!! That's an unbelievable gap to try to make up into a reasonable amount. The second most obvious thing is the stock half-track width falls at least 85mm (3.35") too narrow, so when I ordered the HT 3" suspension links (the max available) I knew that I would also need to choose the offset for my new wheels carefully to make up the difference. The third thing to note (before you purists point out that your stock wheels don't stick out 14mm beyond the stock fender as shown above) is that I haven't drawn in the 1 degree of camber on the rear wheel in order to make my life easier. The OEM specified one degree tip-in moves the top of the tire inboard by 11 of those 14mm's. Lastly, if this issue didn't jump out at you when you looked at the above drawing, that's OK because it took me a while to realize the problem too. Notice how the IFG fender is not the lowest hanging part of the chassis above the tire anymore. Rather, the underside of the upper frame rail is. If you disregard the easily bendable lower weld flange of the upper frame rail, the rail is still 28mm below the IFG fender lip. So that means that if I want 76mm (3") of suspension travel before the wheel contacts the rail, the gap between the top of the tire and the fender at rest would be (76 + 28 =) 104 mm! That's 4.1"! Can you say 4X4 Ferarri? Obviously something needs to change. It's a lot to digest in one post so I'll continue more later. You can make up a good 2-3" on the upper wheel gap by cutting the fiberglass rear quarters and lowering the wheel well down toward the tire. It also then straigthens out your rear bumper body line which also need leveling. I think the pics I sent you last year should give you a good start to where you need to cut and how you lower the wheel well. Pretty easy easy to do end to end by putting a straight square tube at the top of the rear bumper at the corner and then have it go to the front bumper top corner. This body line should be straight. On these kits, the line is slightly forward sloping whereas on oem 355s the body line is almost level. Nature of the higher Fiero frame you have to deal with. Cut the body panels and push the wheel well down until the top of the bumper and the rear quarter body line are matched up to to bar and screw the panels back in place with spacers. Glass the back end up and then start filling the gaps in on the front side. Doesn't take too much fiberglass mat to bring the upper fender well area back up and then some thin skim coats and you are set again. Good luck and drop a line for any other info you may need to do the aligning. Thanks for that timely reminder to sift through your old pics Don... it opened my eyes to another possibility that I had not yet considered. 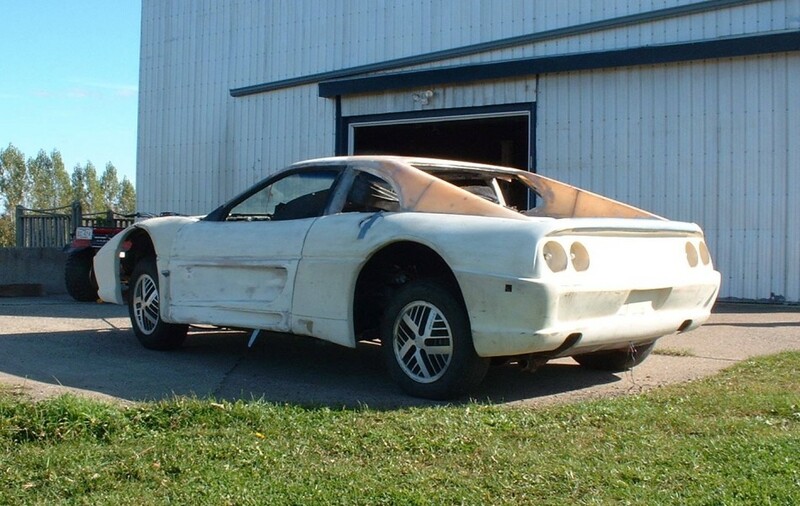 For those that weren't aware, 355Fiero (Don) bought an IFG kit a few years before me and painfully reworked every single panel in a major way. To say he "tweaked" them would be woefully understated. He sent me nearly 200 photos of how he did it, which have at once inspired and discouraged me. Inspired, because now I know this kit can be made into something great, but discouraged because of all the work that lies ahead! So, thanks Don. (If you want to see what I'm talking about, you'll have to prod him to start a thread showing off how he spent several years turning a pig into a purse. So to get back on track with rear suspension mods, I decided to take an iterative approach to modifying the baseline drawing in my last post, starting first with cradle and link modifications, then on to new wheels, followed by a spring drop, and finally a fender reshaping. I needed to find a method of keeping track of each successive change I made so I could backtrack in case an earlier modification conflicted with a later one. So I decided to highlight changes in each successive stage in red. Only new changes from one stage of modification to the next are highlighted, not the cumulative changes from the baseline drawing. If that doesn't make sense, it soon will as I describe the next set of drawings. Stage 1 - Cradle Raising & HT Links. From my earlier kinematics analysis, I knew that I would achieve most of the needed lowering with a spring drop, and needed either to raise the inboard lateral link mounts relative to the cradle, or to raise the entire cradle up into the chassis to counteract the adverse effects the spring drop has on the lateral and trailing link angles. So with measuring tape in hand, I quickly realized that if I took the raised inboard lateral link mount option, interference with the F40 transmission would limit the amount to about 25 mm, with a 10 mm clearance for power train movement. I abandoned that option when it appeared I could raise the entire cradle a full two inches instead. Once I had drawn out that scenario and confirmed that a 1" diameter axle wouldn't contact the underside of the lower frame rail at full jounce, I was quite happy with the result. That is, until I took a few height measurements of the newly raised Northstar engine relative to the stationary decklid. Raising the cradle two inches would've put the highest point of the engine 5 mm above the underside of the decklid, not including any room for powertrain movement. That wasn't going to work. I won't explain the significance of these impacts since this is only an interim level modification and therefore most will change by the time I get through the next 3 stages. Next up is ditching the stock wheels and tires to see how that changes things. Interesting approach by explaining this process in stages. However, to the untrained Fiero builder like myself, it appears a little diabolical as I attempt to see where you are going with this.......... lower the front cradle pivot point, raise the cradle, lower the rear cradle mount but still show 6.25" of ground clearance......... diabolical indeed. I haven't look at one page for so long since I found my dad's Penthouse when I was 10. Looking forward to stage 2. ...it appears a little diabolical as I attempt to see where you are going with this.......... lower the front cradle pivot point, raise the cradle, lower the rear cradle mount but still show 6.25" of ground clearance......... diabolical indeed. It might be easier to wrap your head around it if you consider the cradle was held stationary and the chassis was dropped 25 mm by lopping off the top part of the cradle. The ground clearance to the bottom of the cradle remains the same, but the chassis height was lowered in relation to the cradle. I haven't looked at one page for so long since I found my dad's Penthouse when I was 10. Only a fellow engineer would admit that. That does help with the understanding. I'll keep going over your procedure and attemp to repeat your analysis for my 85 cradle. I think it will be slightly easier with the simpler rear suspension. When its all said and done, I'm hoping the final geometry is still within the realm of the HT wide track system ( AMS).
" Engineers....can't live with them...can't do a thorough suspension analysis without them". unknown. Good point, but after a quick check, this won't solve your problem Don. In the stock config, the bottom of the cradle is essentially at the same level as the lowest parts of the floor pan, so by raising the cradle (ie lowering the chassis) the floor pan will hang lower than the cradle bottom by the amount you raise the cradle. I'll add the floor pan in subsequent drawings because that's what is going to determine the vehicle ground clearance from this point on, not the bottom of the cradle as I've shown. If this works to lower the car down and still keep strut travel, that would be great. Unfortunately it doesn't work that way... by raising the cradle (ie lowering the chassis) the strut compresses from the top end since you're keeping the knuckle at the same height but you're lowering the strut tower. In my case, to regain some of the lost strut travel, I've switched to coilovers which raises the upper bump stop, and redesigned HT's lower strut adapter, which I'll show in my stage 3 drawing. That makes sense. So my suggestion then to setup the rear body section on the Fiero tub will be twofold. The IFG rear section sits on top of the Fiero firewall with the rear window section. The rear clip aligns to that rear window so it sits up off the rear frame. The way the rear clip engine lid lips are shaped, they impact the rear trunk top (rear seal rail if that makes sense) so the rear clip cannot go down easily much further without cutting into the engine lid inner frame and the rear clip and sail panel. So, from what I understand you are doing with the engine cradle, is to raise the engine cradle to make sure you retain a horizontal rear control arm while lowering the car to the desired road height. I am continuing to watch the progress and look forward to seeing how you fill your wheel wells. Blooze, or anyone else, how much can you widen the Fiero? Like how wide can you make the front tire, say a 17 inch tall rim, how wide can you make that fit and work before having to go with a wider suspension? Starting with the tire diameter, I wanted to get a reasonable size to fill the wheel well, but also not be so tall that it would change the rake of the car, causing a need to lower it even more on the springs than otherwise needed. Most people also consider staying with the stock overall tire diameter so as not to throw off the calibration of their speedometers. That was a non-issue for me since I plan to use a GPS calibrated aftermarket speedo. After playing around with the drawings, I decided a tire in the 25" to 25.5" range would be a good compromise between filling the well and not raising the rear too much. Two down, four variables to go. Choosing the width of the tire wasn't just a matter of seeing what the maximum width possible was. Instead, to optimize performance (at least theoretically) tire widths should be proportional to the weight distribution to ensure equal tire loading at all four corners. Since the car's weight distribution is approximately 46% front 54% rear, and my front tires are 215's, a 265 mm rear tire gives 45% tire patch up front and 55% out back. Close enough, and it also happens to be the same width as the real F355 too (well... for the back anyways)! Choosing the wheel diameter was again more than a simple matter of preference. 17 inch wheels with 265mm tires would not clear the top of the knuckle, so 18 inch wheels were the minimum diameter needed. 19 inchers just made too much of a difference with the fronts, which are 17's. So 18 it is. From that decision, the sidewall height automatically fell into my hands since I had already decided the overall tire diameter and width. A 265/35/18 measures 643 mm (or 25.25"). The required rim width was the next thing that needed defining, but the choice of 265 tires narrowed the options. I visited several sites which recommended a minimum of 9.0" and a maximum of 12.0" wide for a 265/35/18. The Goodyear tire site even listed several additional dimensions of the installed tire on a 9.5" wheel, so that's what I chose. The last variable to choose was the wheel offset, but that was pretty easy since I had already determined how much the tire needed to stick out beyond the fender (before adding camber), that automatically meant the 9.5" wheel would need a 38 mm offset given the amount of sidewall bulge defined in the Goodyear tables. The only things drawn in red are things that have changed since the Stage 1 drawing from my last post. The most noteworthy are that the overall ground clearance of the cradle (not the floor pan, Don) was increased by 20 mm, yet the fender gap only closed up 7 mm up top. The reason for the apparent dichotomy is that the new tires have much stiffer sidewalls than the original 215/60/15 tires so the tires are rounder, lifting the chassis up from the bottom more than it closes the gap at the top. Who'da thunk it? -The rotor was redrawn to reflect the 12" Corvette brakes, which added to the impact the new tire and wheel had on the half track width. Next: Stage 3- Spring Drop. Again, awesome information in your last post. I can hardly wait to run out and buy the entire book when you get published. It would most certainly be a hit. I have a question regarding your strut offset brackets. They appeared in your last entry but I can't see where you mentioned the offset you chose. You indicated a 6" track wide increase so can I assume that meant a 3" strut offset? Also, the 1.25 deg reduction in strut angle is due to the 25mm cradle pivot point move? Will this require a tapered shim at the top of the strut? I see the strut offset brackets for sale on the AMS site with various offsets available, but they still talk about a kit to relocate the top of the strut in the strut tower. Why would this be? You have never mentioned it in your thread and it appears you keep the stock location ( albeit a slight change in strut angle). You and I also talked about it during my visit and we seemed to agree it would be an unnecessary change as the location and form of the strut top mount has a unique design. It would seem to make sense to install offset brackets to offset the control arm length increase. Or is there another reason to relocate the top of the strut? Their site mentions moving the top of the strut outboard but that would appear to make the strut interfere with the wheel and tire more.